Acoustics, the science of sound, starts as far back as Pythagoras in the 6th century BC, who wrote on the mathematical properties of stringed instruments. Echolocation in bats was discovered by Lazzaro Spallanzani in 1794, when he demonstrated that bats hunted and navigated by inaudible sound, not vision. Francis Galton in 1893 invented the Galton whistle, an adjustable whistle that produced ultrasound, which he used to measure the hearing range of humans and other animals, demonstrating that many animals could hear sounds above the hearing range of humans. The first technological application of ultrasound was an attempt to detect submarines by Paul Langevin in 1917. 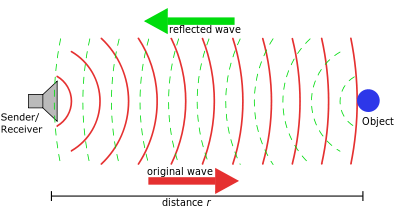 The piezoelectric effect, discovered by Jacques and Pierre Curie in 1880, was useful in transducers to generate and detect ultrasonic waves in air and water. Ultrasound is defined by the American National Standards Institute as "sound at frequencies greater than 20 kHz". In air at atmospheric pressure, ultrasonic waves have wavelengths of 1.9 cm or less. Children can hear some high-pitched sounds that older adults cannot hear, because in humans the upper limit pitch of hearing tends to decrease with age. An American cell phone company has used this to create ring signals that supposedly are only audible to younger humans, but many older people can hear the signals, which may be because of the considerable variation of age-related deterioration in the upper hearing threshold. The Mosquito is an electronic device that uses a high pitched frequency to deter loitering by young people. Many insects have good ultrasonic hearing, and most of these are nocturnal insects listening for echolocating bats. These include many groups of moths, beetles, praying mantids and lacewings. Upon hearing a bat, some insects will make evasive manoeuvres to escape being caught. Ultrasonic frequencies trigger a reflex action in the noctuid moth that causes it to drop slightly in its flight to evade attack. Tiger moths also emit clicks which may disturb bats' echolocation, and in other cases may advertise the fact that they are poisonous by emitting sound. Dogs and cats' hearing range extends into the ultrasound; the top end of a dog's hearing range is about 45 kHz, while a cat's is 64 kHz. The wild ancestors of cats and dogs evolved this higher hearing range to hear high-frequency sounds made by their preferred prey, small rodents. A dog whistle is a whistle that emits ultrasound, used for training and calling dogs. The frequency of most dog whistles is within the range of 23 to 54 kHz. Toothed whales, including dolphins, can hear ultrasound and use such sounds in their navigational system (biosonar) to orient and to capture prey. Porpoises have the highest known upper hearing limit at around 160 kHz. Several types of fish can detect ultrasound. In the order Clupeiformes, members of the subfamily Alosinae (shad) have been shown to be able to detect sounds up to 180 kHz, while the other subfamilies (e.g. herrings) can hear only up to 4 kHz. A popular consumer application of ultrasonic ranging was the Polaroid SX-70 camera, which included a lightweight transducer system to focus the camera automatically. Polaroid later licensed this ultrasound technology and it became the basis of a variety of ultrasonic products. Ultrasonic testing is a type of nondestructive testing commonly used to find flaws in materials and to measure the thickness of objects. Frequencies of 2 to 10 MHz are common, but for special purposes other frequencies are used. Inspection may be manual or automated and is an essential part of modern manufacturing processes. Most metals can be inspected as well as plastics and aerospace composites. Lower frequency ultrasound (50–500 kHz) can also be used to inspect less dense materials such as wood, concrete and cement. Ultrasound inspection of welded joints has been an alternative to radiography for nondestructive testing since the 1960s. Ultrasonic inspection eliminates the use of ionizing radiation, with safety and cost benefits. Ultrasound can also provide additional information such as the depth of flaws in a welded joint. Ultrasonic inspection has progressed from manual methods to computerized systems that automate much of the process. An ultrasonic test of a joint can identify the existence of flaws, measure their size, and identify their location. Not all welded materials are equally amenable to ultrasonic inspection; some materials have a large grain size that produces a high level of background noise in measurements. The potential for ultrasonic imaging of objects, with a 3 GHZ sound wave producing resolution comparable to an optical image, was recognized by Sokolov in 1939, but techniques of the time produced relatively low-contrast images with poor sensitivity. Ultrasonic imaging uses frequencies of 2 megahertz and higher; the shorter wavelength allows resolution of small internal details in structures and tissues. The power density is generally less than 1 watt per square centimetre to avoid heating and cavitation effects in the object under examination. High and ultra high ultrasound waves are used in acoustic microscopy, with frequencies up to 4 gigahertz. Ultrasonic imaging applications include industrial nondestructive testing, quality control and medical uses. Medical sonography (ultrasonography) is an ultrasound-based diagnostic medical imaging technique used to visualize muscles, tendons, and many internal organs to capture their size, structure and any pathological lesions with real time tomographic images. Ultrasound has been used by radiologists and sonographers to image the human body for at least 50 years and has become a widely used diagnostic tool. The technology is relatively inexpensive and portable, especially when compared with other techniques, such as magnetic resonance imaging (MRI) and computed tomography (CT). 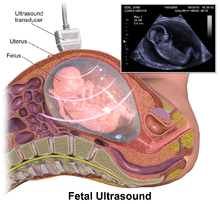 Ultrasound is also used to visualize fetuses during routine and emergency prenatal care. Such diagnostic applications used during pregnancy are referred to as obstetric sonography. As currently applied in the medical field, properly performed ultrasound poses no known risks to the patient. Sonography does not use ionizing radiation, and the power levels used for imaging are too low to cause adverse heating or pressure effects in tissue. Although the long-term effects due to ultrasound exposure at diagnostic intensity are still unknown, currently most doctors feel that the benefits to patients outweigh the risks. The ALARA (As Low As Reasonably Achievable) principle has been advocated for an ultrasound examination – that is, keeping the scanning time and power settings as low as possible but consistent with diagnostic imaging – and that by that principle nonmedical uses, which by definition are not necessary, are actively discouraged. High-power applications of ultrasound often use frequencies between 20 kHz and a few hundred kHz. Intensities can be very high; above 10 watts per square centimeter, cavitation can be inducted in liquid media, and some applications use up to 1000 watts per square centimeter. Such high intensities can induce chemical changes or produce significant effects by direct mechanical action, and can inactivate harmful microorganisms. Ultrasound has been used since the 1940s by physical and occupational therapists for treating connective tissue: ligaments, tendons, and fascia (and also scar tissue). for a pdf version with the author and date information)</ref> Conditions for which ultrasound may be used for treatment include the follow examples: ligament sprains, muscle strains, tendonitis, joint inflammation, plantar fasciitis, metatarsalgia, facet irritation, impingement syndrome, bursitis, rheumatoid arthritis, osteoarthritis, and scar tissue adhesion. Ultrasound also has therapeutic applications, which can be highly beneficial when used with dosage precautions. Relatively high power ultrasound can break up stony deposits or tissue, accelerate the effect of drugs in a targeted area, assist in the measurement of the elastic properties of tissue, and can be used to sort cells or small particles for research. A formerly popular consumer application of ultrasound was in television remote controls for adjusting volume and changing channels. Introduced by Zenith in the late 1950s, the system used a hand-held remote control containing short rod resonators struck by small hammers, and a microphone on the set. Filters and detectors discriminated between the various operations. 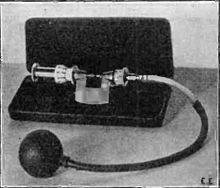 The principal advantages were that no battery was needed in the hand-held control box and, unlike radio waves, the ultrasound was unlikely to affect neighboring sets. Ultrasound remained in use until displaced by infrared systems starting in the late 1980s. ^ Novelline R (1997). Squire's Fundamentals of Radiology (5th ed.). Harvard University Press. pp. 34–35. ISBN 978-0-674-83339-5. ^ a b "Acoustic chatter". The Economist. economist.com. 2015-07-11. Archived from the original on 2015-07-24. Retrieved 2015-07-23. ^ Pollet B (2012). "Chapter 1". Power Ultrasound in Electrochemistry: From Versatile Laboratory Tool to Engineering Solution. John Wiley & Sons. ISBN 978-1-119-96786-6. ^ Corso JF (1963). "Bone-conduction thresholds for sonic and ultrasonic frequencies". Journal of the Acoustical Society of America. 35 (11): 1738–1743. Bibcode:1963ASAJ...35.1738C. doi:10.1121/1.1918804. ^ Takeda S, Morioka I, Miyashita K, Okumura A, Yoshida Y, Matsumoto K (1992). "Age variation in the upper limit of hearing". European Journal of Applied Physiology and Occupational Physiology. 65 (5): 403–8. doi:10.1007/BF00243505. PMID 1425644. ^ Vitello P (12 June 2006). "A Ring Tone Meant to Fall on Deaf Ears". The New York Times. ^ Popper A, Fay RR, eds. (1995). Hearing by Bats. Springer Handbook of Auditory Research. 5. Springer. ISBN 978-1-4612-2556-0. ^ Surlykke A, Miller LA (2001). "How some insects detect and avoid being eaten by bats: Tactics and counter tactics of prey and predator". BioScience. 51 (7): 570. doi:10.1641/0006-3568(2001)051[0570:HSIDAA]2.0.CO;2. Archived from the original on 2015-03-03. Retrieved 2016-08-06. ^ Jones G, Waters DA (August 2000). "Moth hearing in response to bat echolocation calls manipulated independently in time and frequency". Proceedings. Biological Sciences. 267 (1453): 1627–32. doi:10.1098/rspb.2000.1188. PMC 1690724. PMID 11467425. ^ Kaplan M (July 17, 2009). "Moths Jam Bat Sonar, Throw the Predators Off Course". National Geographic News. Archived from the original on 2009-08-22. Retrieved 2009-08-26. ^ "Some Moths Escape Bats By Jamming Sonar". Talk of the Nation. National Public Radio. Archived from the original on 2017-08-10. ^ Surlykke A, Miller LA (1985). "The influence of arctiid moth clicks on bat echolocation; jamming or warning?" (PDF). Journal of Comparative Physiology A. 156 (6): 831–843. doi:10.1007/BF00610835. Archived from the original (PDF) on 2012-04-25. ^ Tougaard J, Miller LA, Simmons JA (2003). "The role of arctiid moth clicks in defense against echolocating bats: interference with temporal processing". In Thomas J, Moss CF, Vater M (eds.). Advances in the study of echolocation in bats and dolphins. Chicago: Chicago University Press. pp. 365–372. ^ a b Krantz L (2009). Power of the Dog: Things Your Dog Can Do That You Can't. MacMillan. pp. 35–37. ISBN 978-0312567224. ^ Strain GM (2010). "How Well Do Dogs and Other Animals Hear?". Prof. Strain's website. School of Veterinary Medicine, Louisiana State University. Archived from the original on August 28, 2011. Retrieved July 21, 2012. ^ Coile DC, Bonham MH (2008). "Why Do Dogs Like Balls? : More Than 200 Canine Quirks, Curiosities, and Conundrums Revealed". Sterling Publishing Company, Inc: 116]. ISBN 978-1-4027-5039-7. ^ Whitlow WL (1993). The sonar of dolphins. Springer. ISBN 978-0-387-97835-2. Retrieved 13 November 2011. ^ Kastelein RA, Bunskoek P, Hagedoorn M, Au WW, de Haan D (July 2002). "Audiogram of a harbor porpoise (Phocoena phocoena) measured with narrow-band frequency-modulated signals". The Journal of the Acoustical Society of America. 112 (1): 334–44. Bibcode:2002ASAJ..112..334K. doi:10.1121/1.1480835. PMID 12141360. ^ Mann DA, Higgs DM, Tavolga WN, Souza MJ, Popper AN (June 2001). "Ultrasound detection by clupeiform fishes". The Journal of the Acoustical Society of America. 109 (6): 3048–54. Bibcode:2001ASAJ..109.3048M. doi:10.1121/1.1368406. PMID 11425147. ^ Hui YH (2003). Food plant sanitation. CRC Press. p. 289. ISBN 978-0-8247-0793-4. ^ Vertebrate pests: problems and control; Volume 5 of Principles of plant and animal pest control, National Research Council (U.S.). Committee on Plant and Animal Pests; Issue 1697 of Publication (National Research Council (U.S.))). National Academies. 1970. p. 92. ^ Fagerstone KA, Curnow RD, ASTM Committee E-35 on Pesticides, ASTM Committee E-35 on Pesticides. Subcommittee E35.17 on Vertebrate Pest Control Agents (1989). Vertebrate pest control and management materials: 6th volume; Volume 1055 of ASTM special technical publication. ASTM International. p. 8. ISBN 978-0-8031-1281-0. ^ Buschow KH, et al., eds. (2001). Encyclopedia of Materials. Elsevier. p. 5990. ISBN 978-0-08-043152-9. ^ a b Papadakis EP, ed. (1999). Ultrasonic Instruments & Devices. Academic Press. p. 752. ISBN 978-0-12-531951-5. ^ a b Betts GD, Williams A, Oakley RM (2000). "Inactivation of Food-borne Microorganisms using Power Ultrasound". In Robinson RK, Batt CA, Patel PD (eds.). Encyclopedia of Food Microbiology. Academic Press. p. 2202. ISBN 978-0-12-227070-3. ^ Hangiandreou NJ (2003). "AAPM/RSNA physics tutorial for residents. Topics in US: B-mode US: basic concepts and new technology". Radiographics. 23 (4): 1019–33. doi:10.1148/rg.234035034. PMID 12853678. ^ Center for Devices and Radiological Health. "Medical Imaging - Ultrasound Imaging". www.fda.gov. Retrieved 2019-04-18. ^ Ter Haar G (August 2011). "Ultrasonic imaging: safety considerations". Interface Focus. 1 (4): 686–97. doi:10.1098/rsfs.2011.0029. PMC 3262273. PMID 22866238. ^ "FDA Radiological Health – Ultrasound Imaging". United States Food and Drug Administration. 2011-09-06. Archived from the original on 2015-07-03. Retrieved 2011-11-13. ^ "Patient Information – Ultrasound Safety". American Institute of Ultrasound in Medicine. ^ "American Institute for Ultrasound in Medicine practice guidelines". American Institute for Ultrasound in Medicine. Archived from the original on 2015-07-01. Retrieved 2015-07-01. ^ "DistanceDoc and MedRecorder: New Approach to Remote Ultrasound Imaging Solutions". Epiphan Systems. Archived from the original on 2011-02-14. ^ "Ultrasound Imaging of the Pelvis". radiologyinfo.org. Archived from the original on 2008-06-25. Retrieved 2008-06-21. ^ Pycock JF. "Ultrasound characteristics of the uterus in the cycling mare and their correlation with steroid hormones and timing of ovulation". Archived from the original on 31 January 2009. ^ McKinnon AO, Voss JL (1993). Equine Reproduction. Lea & Febiger. ISBN 978-0-8121-1427-0. ^ a b Bennett D (May 19, 2005). "Subiaco Abbey's Angus herd". Delta Farm Press. Archived from the original on February 28, 2010. Retrieved February 27, 2010. ^ a b Wagner W. "Extension Effort in Beef Cattle Breeding & Selection". West Virginia University Extension Service. Archived from the original on February 28, 2010. Retrieved February 27, 2010. ^ Watson T (2006). "Therapeutic Ultrasound" (PDF). Archived from the original (PDF) on 2007-04-12. ^ Rapacholi MH, ed. (1982). Essentials of Medical Ultrasound: A Practical Introduction to the Principles, Techniques and Biomedical Applications. Humana Press. ^ Statnikov E. "Physics and mechanism of ultrasonic impact treatment". International Institute of Welding. ^ "UIT Solutions Video". appliedultrasonics.com. Archived from the original on 2012-05-10. Retrieved 28 September 2012. ^ "Tools of the Trade". appliedultrasonics.com. Archived from the original on 2008-05-31. Retrieved 28 September 2012. ^ Peshkovsky AS, Peshkovsky SL, Bystryak S (July 2013). "Scalable high-power ultrasonic technology for the production of translucent nanoemulsions". Chemical Engineering and Processing: Process Intensification. 69: 77–82. doi:10.1016/j.cep.2013.02.010. ^ Peshkovsky SL, Peshkovsky AS (March 2007). "Matching a transducer to water at cavitation: acoustic horn design principles". Ultrasonics Sonochemistry. 14 (3): 314–22. doi:10.1016/j.ultsonch.2006.07.003. PMID 16905351. ^ Peshkovsky AS, Peshkovsky SL (2010). "Industrial-scale processing of liquids by high-intensity acoustic cavitation-the underlying theory and ultrasonic equipment design principles". In Nowak FM (ed.). Sonochemistry: Theory, Reactions and Syntheses, and Applications. Hauppauge, NY: Nova Science Publishers. ^ Peshkovsky AS, Peshkovsky SL (2010). Acoustic cavitation theory and equipment design principles for industrial applications of high-intensity ultrasound. Physics Research and Technology. Hauppauge, NY: Nova Science Publishers. ^ Dion JL, Malutta A, Cielo P (November 1982). "Ultrasonic inspection of fiber suspensions". Journal of the Acoustical Society of America. 72 (5): 1524–1526. Bibcode:1982ASAJ...72.1524D. doi:10.1121/1.388688. ^ Akin B, Khanal SK, Sung S, Grewell D (2006). "Ultrasound pre-treatment of waste activated sludge". Water Science and Technology: Water Supply. 6 (6): 35. doi:10.2166/ws.2006.962. ^ Neis U, Nickel K, Tiehm A (November 2000). "Enhancement of anaerobic sludge digestion by ultrasonic disintegration". Water Science and Technology. 42 (9): 73. doi:10.2166/wst.2000.0174. ^ Oie S, Masumoto N, Hironaga K, Koshiro A, Kamiya A (1992). "Microbial contamination of ambient air by ultrasonic humidifier and preventive measures". Microbios. 72 (292–293): 161–6. PMID 1488018. ^ Atul K, Ram AM (2008). "Efficient Synthesis of Hantzsch Esters and Polyhydroquinoline Derivatives in Aqueous Micelles". Synlett. 2008 (6): 883–885. doi:10.1055/s-2008-1042908. ^ Butler JG (2006). Television: Critical Methods and Applications. Routledge. p. 276. ISBN 978-0-8058-5415-2. ^ Part II, industrial; commercial applications (1991). Guidelines for the Safe Use of Ultrasound Part II – Industrial & Commercial Applications – Safety Code 24. Health Canada. ISBN 978-0-660-13741-4. Archived from the original on 2013-01-10. ^ AGNIR (2010). Health Effects of Exposure to Ultrasound and Infrasound. Health Protection Agency, UK. pp. 167–170. Archived from the original on 2011-11-08. Retrieved 2011-11-16. Kundu T (2004). Ultrasonic nondestructive evaluation: engineering and biological material characterization. Boca Raton, FL: CRC Press. ISBN 978-0-8493-1462-9. Grzesik J, Pluta E (1983). "High-frequency hearing risk of operators of industrial ultrasonic devices". International Archives of Occupational and Environmental Health. 53 (1): 77–88. doi:10.1007/BF00406179. PMID 6654504.